First, please share some about your background and experience as a social media marketer. My interest in social media and marketing developed while I was working at GSD&M in Austin. At work, I was part of a team that was making ads all day. At night, as a consumer, I was looking for ways to skip them. The irony of that was not lost on me. In 2003 as I was working on an advergame program for Dial’s “Coast” soap brand built around Matt Hoffman’s ProBMX game I realized that advertising may be better received if it had a very strong participative, non-interruptive character. That got me interested in what was emerging as the Social Web, aka, Web 2.0–and the content that people make and then share–and to the discipline of social media based marketing. 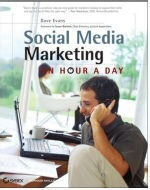 You’ve written a great book, “Social Media Marketing an Hour A Day“. What prompted you to write it and if you were to write your own 50 word or less review, what would it be? First, thank you for the compliment. I sincerely appreciate the positive reception to my first book. I had been thinking about writing a book based on the work I doing around the purchase funnel and the impact of word-of-mouth, and as an expansion of a whitepaper on social media that I’d written in 2004 when serendipity stepped in. Wiley|Sybex’ Acquisition Editor Willem Knibbe called me and asked if I’d write this book. It was an honor to say ‘yes’. Eleven months later it was on Amazon. The book itself is designed for social media practitioners, traditional marketers, and others interested in applying social media based concepts and practices to marketing. In 55 daily one-hour exercises, it presents a survey of the Social Web, resources and tools for aligning a brand with the specific needs of highly connected consumers, and important tips and best practices ranging from disclosure and transparency to effectively presenting a social media program. In the course of having conversations with people about what you do and the book, how do you define “social media” for people who aren’t in the digital marketing business. I define social media as it applies to marketing in terms of the content–text, audio, photos, videos–that is created and shared on and through the web for the purpose of conveying an experience or influence an outcome. Note that this applies equally to consumers and marketers: the key word in my definition is “participative,” which is of course what separates social from traditional media. What arguments or business case justifications have you found to be the most effective for investing time, people and other resources into social media engagements? The most compelling case I know of is showing a brand or product manager what is being said about his/her brand, product, or service on the Social Web and then asking what is being done to leverage, correct, or otherwise respond to this conversation. Too often the answer is “nothing” which is course a mistake: Positive conversations are floating past without being tapped, and negative discussions are left unchecked. The result is a slower product or service evolution cycle than what be available if these same resources were tapped, and that translates directly into a competitive disadvantage. In these times, who can afford that? When developing a social media strategy, how do you decide the tactical mix? Facebook, Twitter, YouTube or something completely different? I begin with business objectives and an understanding of the audience. A listening strategy is distinct from an outreach effort, and without a handle on objectives and audience it’s impossible to develop either of these. For many applications, simply listening and understanding current conversation is the right starting point: Using Twitter, Flickr, Facebook for marketing…all comes later. What’s your decision making process when it comes to testing and implementing social media engagement efforts with specific tactics? First and foremost, I help clients develop a quantitative baseline: What is the state of the current marketing program? As noted above, next up is the integration of objectives and audience data. With these pieces in place, we can devise experiments–often based on early listening results–that involve selected social channels which work to supplement what is happening in other marketing channels. What strategies do you use to measure the effectiveness of social media? What metrics make the most impact when reporting them upstream in an organization – to key executives or CEO? I am a strong advocate of quantitative measurement: Chapter 13 of “Social Media Marketing: An Hour a Day” is dedicated to it. The Social Web, because it is digital, is fundamentally measurable. There are a number of platforms that facilitate direct measurement of conversations, and which give you a handle on what is being said. Then, by connecting social analytics with web analytics via referrer and related data (not perfect, but better than nothing) we can tie the conversational impact to the conversion process. This opens the entire set of traditional web measures which can be used to establish an ROI and other fundamental indicators that are of interest at the C-level. Can you share an example of how you’ve successfully employed a social media effort (large scale or a specific tactic) and how you measured success? (marketing, ORM, branding, etc) URLs to examples are very much appreciated. Three come to mind immediately, as all are fundamentally different in their goals. First, Meredith Publishing and its communities like Parents/American Baby and Better Homes and Gardens. Working with Meredith’s Community Manager we developed a strategic roadmap guiding their use of the Pluck community platform. The objective was stronger engagement between individual print and online subscribers via the content discussions in which they were engaged. In this case, we gauged success in terms of page views–the base line indicator for publishers–and the size of the community as it grew over time. Next is Premiere Global, a provider of scalable electronic messaging services. Premiere’s platform powers many of the financial trade transaction confirmations that people receive, hurricane evacuation notices, and similar. Premiere developed an API around its platform, and then invited developers to build monetized application using these tools. Working with Austin’s FG SQUARED, we developed a support and learning community built on the Jive Software platform for application developers to facilitate the spread of tips and knowledge in order to build more and better application based on PGI’s underlying API and service platform. We are measuring the number of applications developed, and the revenue associate with them. This is essential a direct measure of ROI. Finally, working again with FG SQUARED and its client, University Federal Credit Union, we implemented Techrigy’s SM2 social media monitoring platform to engage the credit unions marketing and operations units with conversations of interest. This is the first step in what will be a larger social media based implementation, and is a great example of the ways in which innovators within organizations can take initial steps into social media. Measurement in this case is related to the conversations uncovered, and their value in terms of intelligence to the firm. Dave Evans is a social media strategist and business consultant though Digital Voodoo, a firm Dave cofounded in 1994. In 2005, he cofounded HearThis.com, a podcasting service firm, and maintains a blog at ReadThis.com. Great article. Where can I get the book and how can I sell it as an affiliate? Lee – good interview. I’d be interested to know how you got in contact with Dave to ask for the interview; marketing your idea for a post as it were. As a neuroscientist I’m quite interested in the social web myself and have been trying to describe how crowd behavior works online in a recent article Follow the Herd. Good site lee – wish I’d visited while I was setting up mine, consider me subscribed. Wow, I am surprised that I haven’t found this website yet. Great information and very informative, thanks Lee. I just ordered the book from Dave, I can’t wait to get it in the mail. Take care. Great post. Thanks. It gave me an interest in the book and is full of good ideas. Thanks Lee for the informative post and for including the Premiere example. We are incredibly proud of our partnership with Dave, Jive, and FG2 to bring the added value of social media and networking to our employees, customers, and development partners through our PGiConnect.com developer community. Your exchanges on business case justifications, reporting upstream, and success measures are spot-on for brand or product/marketing managers trying to promote the idea of social media marketing within their organization. Great interview. Keep up the good work Lee. Thanks for the great interview post Lee. I’m in the middle of Dave’s book and have found it to be quite informative, utilizing a very practical approach to social media. I really enjoyed the way Dave has explained social media’s influence upon the “consideration” phase of the traditional marketing model. Makes total sense. This is a great book! I read it the other day while spending several hours relaxing in the book store, recommend it to anyone who wants to dive into social media marketing! An hour a day is an excellent recommendation…very practical approach from someone who really knows his stuff. I have gotten good results from participating in LinkedIn and Twitter, and an hour is just about what it takes…and all the time I can spare, anyway! Great interview, thanks! Great interview! I agree that using the social web for listening and participatory interaction is the key!